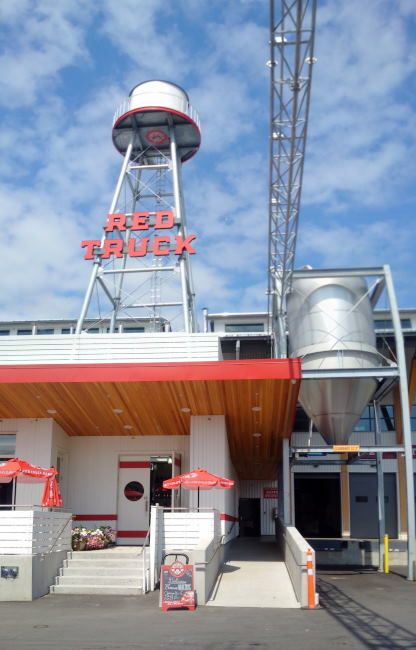 Red Truck Beer recently opened their doors to their new Brewery and Diner in Vancouver. I had stopped by the brewery to check out the diner during their soft launch and that post can be found here. At that time I was not able to get a tour of the brewery itself though. That has now changed though as I have now had the pleasure of getting a quick personal tour of the facility. The tour started by heading up a set of stairs to the second level of the facility (A fairly massive facility). After being introduced to a handful of the staff at the brewery I was led over to the packaging area first as the canning machine was currently running. The automation level in the canning and bottling line at this brewery is in a small class of the largest breweries in the province and is quite a sight to see. Once we had finished checking out the packaging line we walked over the the brewery side of the operation to see what it looked like. Very few craft breweries have a brewing system with the kind of automation that Red Truck Beer has with the possible exceptions of Central City Brewers & Distillers, Steamworks and possibly Parallel 49 (Did I miss someone). The brewers and Brewmaster are still the brain of the operation but some of the grunt work has been taken out of the equation with computerization and other mechanical operations. This computerization can be seen from the second level mezzanine that looks out over the brew house and tank farm. From here we walked down some stairs to the actual brew house. They were currently brewing their lager so I was able to take a peak through the windows of their tank. After seeing the brew house we walked down more stairs to see the underside of the brew house. This is a truly impressive brewing space and I look forward to what they have in store for us in the future. Also yes that is a full sized truck hanging from the ceiling of the brewery with a load of kegs in the trucks bed! make sure to take a trip over to the new Red Truck Beer location for a pint or two and some food. This entry was posted in Brewery and tagged automated, automation, beer, brew house, brewery tour, craft beer, east vancouver, packaging, packaging line, red truck, red truck beer, Tour, vancouver.